Now you can use the all new Weight Loss Tracker with BMI template to track the progress of your new diet or workout routine with ease. This document comes fully equipped with all the knowledge and calculators that you’ll need to enter your information and watch as the data comes to life in an organized system of graphs and charts that will show you how to lose weight more effectively. You can take your health and weight loss goals back into your own hands using this free template. To learn more about the document, just continue reading the guide given below. In the tab titled, “BMI Info” at the bottom of your screen, use the given table to access your body type from the body mass index. You will then enter all your caloric and nutrition information in the “Data Entry” tab. When you’re ready to start recording this information, simply enter the date in the first column, your current weight, the calories that you need to burn in order to reach your goal each day, then the nutrition that you consumed for the day as well. 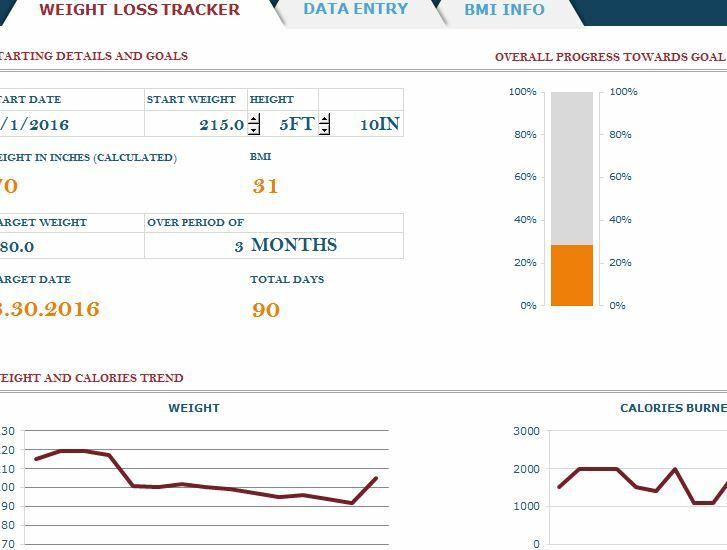 As long as you follow the Weight Loss Tracker with BMI and the data that is displayed above, you can’t go wrong! When you need to start a new day, just move down to the next row and begin the whole process over again. When you have worked up a few weeks of data, go to the “Dashboard” tab for more information. At the top of this table, you can choose the data you want to look at. If you want to select all the data you’ve accumulated so far, just change the parameters of the dates at the top. You can also use the same method to look at your progress for the month. You can see your target weight and the time you’ve spent on your program in the next table below. The graph to the right of the Weight Loss Tracker with BMI page displays your overall progress with a percentage so you can stay motivated as the bar graph gets closer and closer to your goal. If you want to see individual trends for your weight-loss, calories burned, water consumed, or your nutrition intake, the graphs at the very bottom show you that as well. Get in shape this year using the free Weight Loss Tracker with BMI!